Plans that would enable an additional 3.6 hectares (8.9 acres) of land for employment on the Advanced Manufacturing Park (AMP) in Rotherham are set to be approved next week. The UK's premier advanced manufacturing technology park is home to world-class research and manufacturing organisations such as the University of Sheffield, Boeing and Rolls-Royce and smaller, emerging companies developing the next generations of cutting-edge technology. The site also benefits from Enterprise Zone status. The AMP is part of the wider Waverley development being brought forward over the next 20 years by the Harworth Group, one of the largest property and regeneration companies across the North of England and the Midlands. Plans submitted last year are for engineering works to level an artificial valley between the Sheffield Parkway embankments and the embankments associated with existing development platforms in the AMP. 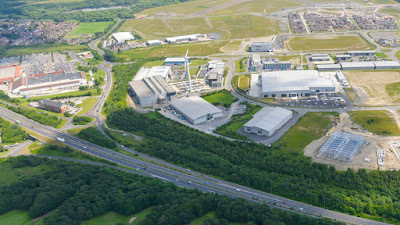 Approximately 85,000 cubic metres of material would be needed in two phases to create development plots from restored scrubland between the Parkway and existing buildings occupied by The University of Sheffield Advanced Manufacturing Research Centre (AMRC) with Boeing and X-Cel Superturn. Harworth, which is based on the development, has brought forward capital investment, ensuring that there is land available for immediate occupation in the next phase. It hopes that the plans would go on to generate additional jobs and investment - "Such an extension would form part of the existing AMP which is fast becoming a high profile business destination and is attracting major employees to the area. Thus, it is envisaged that the application site will be a highly desirable location for businesses to either relocate or start up." An officer's report to the planning board at Rotherham Council recommending that the plans be approved, states: "Future development on the application site would be subject to additional planning applications; however it is acknowledged that the proposed engineering works would be carried out to accommodate future industrial/business uses. In this regard, it is considered that the temporary engineering works to create the development plateau would assist in providing a level area for future industrial/business development which will complement existing and committed development on the AMP and will assist in providing further employment on this prime development site." The proposed engineering works will result in the loss of some existing planting along the Sheffield Parkway frontage. A draft concept landscaping plan shows a new urban frontage set to enhance the landscape character of the Parkway. A development plateau on land immediately to the south-west of the development site is nearing completion. Plans are continuing for Phase 2 of the successful R-Evolution development for two more units, both of which could be subdivided to make four units in total. The units would be from 11,000 to 26,000 sq ft and Colliers and LSH have been advertising the property. There is around 50 acres that remain to be developed for employment use at Waverley. A larger development of up to 300,000 sq ft, called "AMPlify" is predicted on a further 21 acres. Plans are also coming forward for a local centre with the potential for further offices, a hotel, conference centre, gym, retail units and community facilities complimenting the AMP and wider Waverley development.